A Himalayan salt brine also known as Salt Sole is very easy to make and you can use it for bathing or also drinking. About a teaspoon of salt brine a day on a consistent basis has many health benefits. Contrary to popular belief, salt is not bad for you. 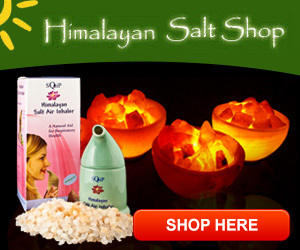 Himalayan salt is the purest salt on earth and does not contain any chemicals or additives. It has no pollutants as it comes from the foot of the Himalayan Mountains with no processing. In a glass jar that has a lid, such as a mason jar, fill with Himalayan salt chunks or crystals. Add spring or purified water to the top filling the jar. Close and let sit for 24 hours. If the salt has dissolved add a few more pieces to the mixture and allow to sit again. When the crystals sit at the bottom of the jar and no longer dissolve, the solution is ready to use. Note: the salt is anti bacterial and anti-microbial and can be stored for years. You can add to the same jar forever. It can be stored in this glass container without any altering of it’s properties or decomposition. I really like this glass jar below. It has a wooden spoon so you can stir it to help it dissolve. I don’t know about you, but I am a stirring person. You need to make sure an use a wooden spoon to do this and not a metal one! This Himalayan salt sole jar comes with this spoon! You can find this Himalayan Sole Jar here under the edible salt menu.. There are many benefits of a Himalayan salt bath, from cosmetic, to health and relaxation. Salt baths have been used for centuries by the ancients. Salt baths were used in Egypt and Rome it became popular in Asia and Japan and was referred to as ritualized bathing and spas were opened with bathing as the main point of attraction. A himalayan salt bath detox bath is amazing to say the least. Cleopatra would soak in the dead sea which has the highest concentration of salt of any body of water in the world. This was for cosmetic benefits. Bath salts are known to soften ans smooth the skin and have been referenced as the fountain of youth. One of the benefits of a Himalayan salt bath is the detoxification and healing of the skin. It has been known to help psoriasis and heal acne as well as heal insect bites and dry itchy skin. Soaking in a salt bath is know to relieve inflammation of the joints and muscles. It can be used to treat arthritis. It also works to sooth sprains and other muscle aches. It hydrates the skin and increases moisture retention. It also relaxes and helps promote a good nights sleep. Many who soak in a Himalayan salt bath report feeling energetic yet relaxed. This is possibly because the salt works to remove toxins from your body. It also helps to stimulate blood circulation. A long soak in a bath of Himalayan salt can also help with premenstrual symptoms. It can relive cramping and bloating. Another one of the benefits of a Himalayan salt bath reported is a better sleep. You are relaxed and getting to sleep comes easier! Himalayan salt for sleep is a huge benefit. Add about 2 pounds of Himalayan salt to your typical bath. The water should be warm, not hot, about 97 degrees. The salt actually helps maintain the water temperature of the bath. You may add a few drops of essential oils for aromatherapy if desired. For a mineral treatment soak for about 15 minutes. For a full body detox, soak for 30 minutes. Do not rinse the salt off of you body, simply pat dry with a towel. Relax for another 30 minutes! Himalayan salt is the purest salt on earth and has no pollutants. It is mined from the Himalayan mountains and contains no chemicals or moisture absorbents such as your standard table salt. Himalayan salt also contains 84 minerals that our body needs. The benefits of a Himalayan salt bath are tremendous. I love the way I feel after a 30 minute soak and yes I do sleep like a baby, not to mention I have softer, clearer skin. You can purchase this salt in two forms, the large chunks or you can purchase it ground up. The large chunks do take a bit longer to dissolve, but dissolve they will. I prefer the chunks as I can also make a salt brine from it for other purposes. I buy all of my Himalayan salt supplies at the Himalayan Salt Shop here. I love Salmon and I grill it often, but I have wanted to try it grilling Salmon on a Himalayan Salt Block. A few weeks ago, I ordered myself one from the Himalayan Salt Shop here and set out to see if it was any difference in just grilling it in a normal way. I must say it was absolutely delicious so I am inclined to share exactly how I did this. It had a unique mild salty flavor, very different from your standard table salt. It just melted in my mouth and was a huge hit at my house. I also grilled a side of fresh pineapple. It was an excellent compliment to the savory salmon steaks. Below is my recipe for marinating and basting the 4 nice sized salmon steaks. * Teriyaki sauce is also delicious in this recipe. Stir it together. You can heat it in the microwave for about 30 seconds to dissolve the sugar. This is your marinade. I spread this over the Salmon with a silicone basting brush and put in refrigerator to marinade while I lite the grill and get my Himalayan salt block ready. How To Heat Your Salt Block For Grilling! When grilling Salmon on a Himalayan salt block you don’t want to heat the Himalayan salt block to quickly. It is delicate and can break apart if exposed to extreme heat too fast. That being said, you don’t want to put it on the grill as soon as you lite the charcoal. I do use charcoal and not a gas grill though this can be done on a gas grill. Usually about 15 minutes is about right. If you have a top rack, place the block on the top rack and close the grill to heat the salt block thoroughly. .This takes about another 15 minutes. Have a glass of wine or cold beer while you wait. Always makes the grilling more relaxing! You can tell your Himalayan Salt block is hot enough when you hold your hand about 4 inches above it and the heat is uncomfortable. Next I use my silicone grilling gloves to move the salt block to the bottom rack. If you don’t have a top rack, you can always put the salt block to the side of the coals and out of the direct heat when heating the block. I place the fish on the salt block and baste it once again. Close the grill for about 4 minutes, turn salmon and repeat. Once you remove salmon, you can scrape the salt block with your grilling brush and place the slices of fresh pineapple on it. Baste with leftover marinade and grill until lightly browned on both sides. Yummy! Please note that an 8 inch Himalayan Salt block will hold about 3 nice size Salmon Steaks. If you are feeding more than two you will need a larger salt block or perhaps two 8 inch Himalayan Salt Blocks. Another important thing you may want to consider is it is difficult to move a salt block on and off a grill. They are heavy and cumbersome. I have a salt block plate like this one and you can get it here on Amazon. My best friend and I demonstrate how to cook Salmon on a Himalayan salt block in the video below. Warning! We had a few beers waiting for the salt block to get hot! Himalayan Salt blocks or as some call them bricks or plates, make a wonderful serving plate for cold food or appetizers. They say presentation is everything and that is putting it mildly when serving food on a salt block. Himalayan Salt blocks are anti-microbial and anti bacterial. Not only are they beautiful serving platters, but the deliver the benefits of pure Himalayan salt with no preservatives or additives. When food like Sushi is served on a salt platter, it takes on a gourmet, yet delicate flavor that you won’t forget. If you are hosting a dinner party or a romantic evening for two, Himalayan salt blocks will Wow your guests. You simply chill them in the refrigerator or freezer for a few hours before hand. They make an excellent platter for fruits, vegetables, cheeses and of course a favorite of many, Sushi! Sushi On A Himalayan Salt Block! Speaking of Sushi, I can’t think of a better way to serve it. Putting fish on a salt block is a bit like returning it to it’s natural element of the sea. If allowed to remain in contact with the salt, a natural semi curing occurs, adding a light and delicate hint of salt. A Himalayan salt block really compliments foods like Sushi or Sashimi! Salmon or other foods can be cured with a salt block also known as Gravlax. You can find many recipes and directions on how to do this here. Serve Deserts on A Himalayan Salt Block! Another fabulous way to impress your guest with food on a salt block is to serve your deserts on it after a meal. Whip up your favorite sorbets or custards and pour them over the frozen salt block. This will give your desert a lite hint of saltiness that is a delight to the taste buds. These are my favorite for serving cold appetizers on a chilled salt block. So as you can see, Himalayan Salt Blocks are not just for cooking. Cold food on a salt block is just simply Divine! I highly suggest you buy at least two salt blocks. One for serving and one for cooking. Cleanup of these blocks is simple. You can just rinse them quickly and dry with a towel or wipe down with a damp cloth. Do not place them in the dishwasher. They are made of salt and they will be gone when you to remove them. You can find the finest quality salt blocks by clicking on the link below to the Himalayan Salt shop! Himalayan Salt Block Cooking is a culinary treat. It adds a delicate flavor that just can’t be described. You would think it would be very salty, but the salt flavor is mild due to their lack of porosity which means that the surface area touching your food in minimum. They also have over 80 trace minerals which add a unique and almost heavenly flavor to foods. This salt blocks or plates can stand extreme temperatures from cold as in zero degrees up to 900 degrees. This makes Himalayan salt block cooking very diverse, from serving cold deserts to searing meets and vegetables or even baking. They also hold heat for a very long time. Himalayan salt block cooking intimidates many. The slabs are delicate and they are heavy. A salt slab depending on size can weigh up to 30 pounds. I think of having to use two hands much like I did with my Mama’s cast iron skillet. I can assure you however that this way of cooking on a salt block might put your Mama’s cooking to shame. The key with salt block cooking is to heat them up slowly for they will crack and can break. It also needs to be 2 inches in thickness. They can last for a long time with proper care but will not last forever. If it breaks there are many other uses for this salt so it won’t be wasted. You can grind it up and use for seasoning, curing foods, or toss it into a relaxing bath. Salt block cooking can be done in an oven, on a stove top, gas stove, gas grill, charcoal grill or an open fire. it is a fantastic tool to use in camping! Everything just taste better cooked on a salt block. Often no other seasoning is even necessary. When grilling you can cook on top of it or you can place it on top of your meat on the grill. When placed on top, you sear both sides at once. Imagine butterfly chicken breasts like this. Just yum! Cleaning is also a cinch. Because of it’s anti-microbial properties no soap is needed. Just wipe with a damp sponge and scour away any food residue with a scrubber or scouring pad. You can repeat this process a couple of times and pat it dry with a paper towel. Do not put it in a dishwasher. It will dissolve! You can find a large variety of quality Himalayan Salt blocks for cooking by clicking here. One more thing that I need to mention when cooking with a salt block. They are heavy and awkward to move on and off a grill or in and out of the oven. I bought a salt plate holder from Amazon. The link is below. This has made it so much easier to handle. Do Himalayan salt lamps work when it comes to improving your indoor air quality? Some say there is no evidence. Those that use them through out their home will beg to differ. Himalayan salt lamps work by producing negative ions. Negative ions are produced in nature. Have you ever been outside during a thunderstorm or standing next to a water fall and felt exhilarated? That is because of the negative ions being naturally produced. Salt attracts moisture from the air. If you doubt this open your salt shaker! That’s why we put rice it it! The way a Himalayan salt lamp works is the light bulb inside heats it up and causes this moisture to evaporate. In this process is where negative ions are generated and released into the air. Negative ions are known to improve air quality by balancing the electrical energy in our homes. Computers, televisions and other electrical appliances omit positive ions that can drain our energy levels. By adding negative ions to your environment, you change the quality of the air you breath. The benefits of adding negative ions to your indoor air include a natural air freshener, your air just smells cleaner, reduction or elimination of allergens, dust, mold, and other pathogens that can affect your respiratory functions. One customer has one by his bed and has reported his snoring has ceased to exist. I have found those that say salt lamps don’t work have purchased one little lamp with the expectation that it would improve the quality of air in their entire house. If you are only going to buy one little lamp, put it either by your bead or in your work space. One 6 pound Himalayan salt lamp will work in a space about the size of an office cubicle. You need to know what size salt lamp you need for your room. To get the maximum positive health benefits of a Himalayan salt lamp, you need to have one or two in every room depending on the size of the room. This is a natural alternative to the expensive air ionizer that you see. There is no maintenance, no filters to buy and they last forever unless you drop it on the floor and break it. The only thing you will have to replace is the light bulb which is less than a couple bucks a year. Please note that if the lamp wattage is not high enough, your salt lamp can leak or sweat. In addition to the healthy benefits of Himalayan salt lamps they are beautiful, ambient and aesthetically pleasing. Excellent additions to any room or spa. They create a warm soft glow that add to any room. You can purchase the beautiful salt lamps here at The Himalayan Salt Shop. Please know I do receive a small commission from your purchase so thank you in advance! A Himalayan Sea salt inhaler is a natural remedy for many respiratory conditions such as sinus issues, allergies, asthma, respiratory infections, smokers cough to name a few. Using a Himalayan sea salt inhaler for 15 minutes a day offers many health benefits. It can kill bacteria and reduce inflammation and reduce mucus. Salt therapy, also known as Halotherapy (halo is Greek for salt) has been around for years and dates back to the Roman and medieval times. People have traveled from all over the world to visit salt caves in ancient Europe. The 19th century Polish salt miners were also shown to have far fewer respiratory illnesses. The first salt treatment center was in Wieliczka, Pland and many man made Himalayan salt caves or salt treatment rooms are popping up in day spas. Treatment can be very expensive, up to $500.00 per hour. A Himalayan salt inhaler is a less expensive and effective alternative. A salt inhaler is usually around $30 or $40 bucks and the salt crystals last for months. Replacement salt is less than $10 bucks and one bag can last a long time considering the small amount 92.5 ounces) of crystals needed in the inhaler. Asthma suffers often note a significant decrease in attacks and seasonal allergy sufferers also have reported a measurable reduction of symptoms. Users also report that the duration of colds and flu are greatly reduced by the use of a Sea Salt Inhaler. Please note: A Himalayan Sea Salt Inhaler is not meant to take the place of your prescribed medications. If you see major results, please consult with your doctor before making changes to any medications you are taking. Cleaning is easy. When you get your Salt Inhaler just rinse it out with warm water to remove any dust particles. It must be completely dry before you add the Himalayan pink salt. You can use a hairdryer if you don’t want to wait for it to air dry. When you change your salt, which is about once a month, again just use warm water and wait for it to dry. No soap is needed. How Does a Himalayan Sea Salt Inhaler Work? When you breath into the salt inhaler, air passes over the salt crystals and through your respiratory track. The moisture there absorbs the salt particles on the way to the lungs. You can purchase a Himalayan Sea Salt Inhaler by clicking on the image below or go straight the the Himalayan Salt Shop Here!